Home Uncategories Indian Satellite Finally made it to Mars! Indian Satellite Finally made it to Mars! India went Mars because Japan and China had tried and failed and she wanted the glory to the first Asian country to succeed. 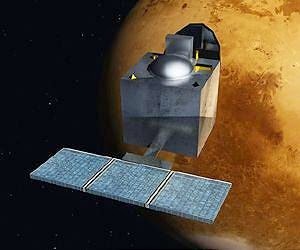 The small cars sized Mars Orbiter Mission (MOM) with its modest 15kg science package of five instruments was launched by the Indian Space Research Organisation (ISRO) on 5th November 2013 from India's space port Shriharikota on the east coast and is due to arrive on 24th September. Scientists broke into wild cheers Wednesday morning local time as the orbiter's engines completed 24 minutes of burn time and maneuvered into its designated place around the red planet. The success of India's Mars Orbiter Mission, affectionately nicknamed MOM, brings India into an elite club of Martian explorers that includes United States, the European Space Agency and the former Soviet Union. The Cold War between the Soviet Union and USA gave rise to the Space Race that took men to the Moon has now re-emerged in Asia. Japan, India and China now competes for national prestige and glory in space "firsts" but just like the Space Race of the 1960's each nation denies that a race exists. The spacecraft launched on November 5, and has traveled over 650 million kilometers to enter Mars orbit. Its mission is to orbit the Red Planet, mapping its surface and studying the atmosphere. "We have gone beyond the boundaries of human enterprise and innovation," Prime Minister NARENDRA MODI said, standing alongside ISRO scientists at the command center in the southern tech hub of Bangalore. "We have navigated our craft through a route known to very few. ".......I think we in naija needs to orbits Sambisa forest first and #bringbackourgirls, before trying Jupiter...hahaha!